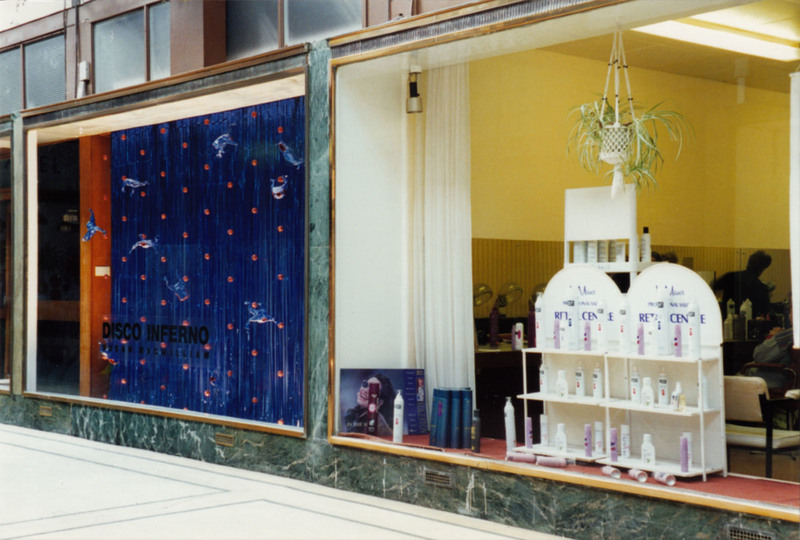 Installed in a vacant shop window DISCO INFERNO makes a spectacle of peripheral sites. 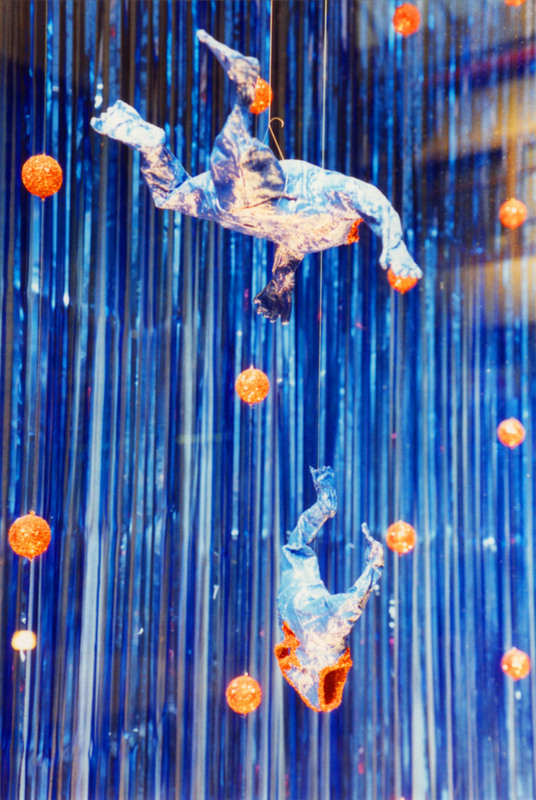 Blue shimmer curtains provide the backdrop to a polka dot pattern of red glitter balls and hollow headless blue bodies with red glitter innards. Lit from below with halogen lights the suspended elements rotate and sparkle. Images to follow once scanned from transparencies. Installed in a vacant shop window DISCO INFERNO makes a spectacle of peripheral sites. Blue shimmer curtains provide the backdrop to a polka dot pattern of red glitter balls and eleven hollow headless blue bodies (made from stiffened canvas) with red glitter innards. Lit from below with halogen lights the work is animated as the suspended elements rotate and sparkle. 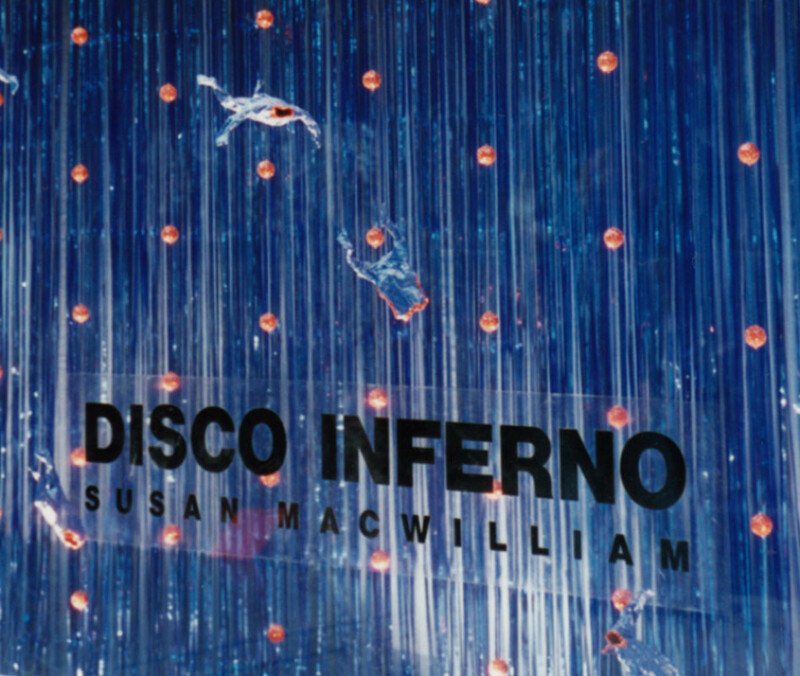 The title DISCO INFERNO is applied to the window using 5' long vinyl text. DISCO INFERNO makes reference to the aesthetic of the television game show and the theatrical stage cabaret, while intimating to the possibility of something sleezy behind the scenes. 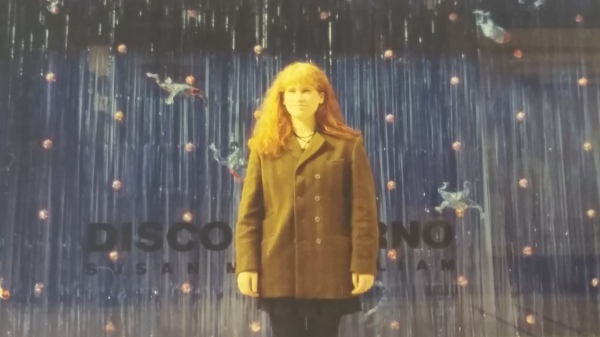 DISCO INFERNO, 1995, is a site specific work made for Arcadia, an exhibition that used the empty shop units in Belfast's North Street Arcade for the installation of art works. 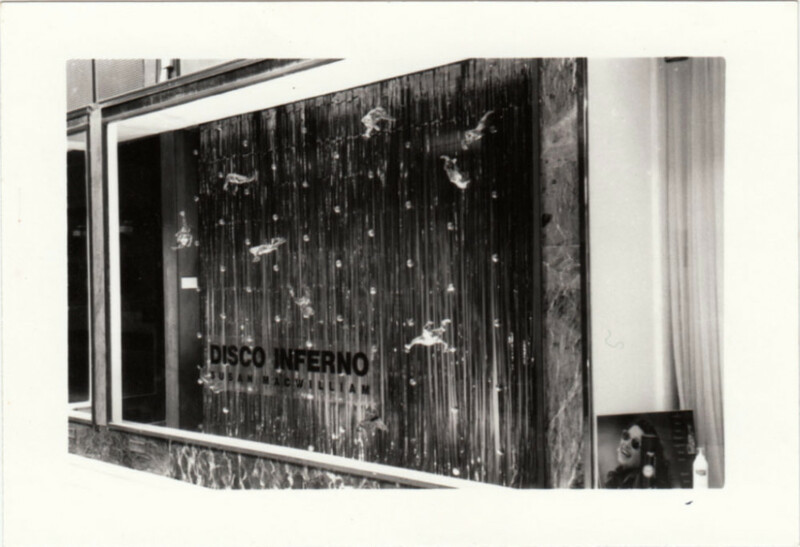 DISCO INFERNO occupied a large window space, and measured 9' x 12' with a depth of 2' behind the glass. A flexible backdrop, DISCO INFERNO makes theatrical any space to which it is taken. 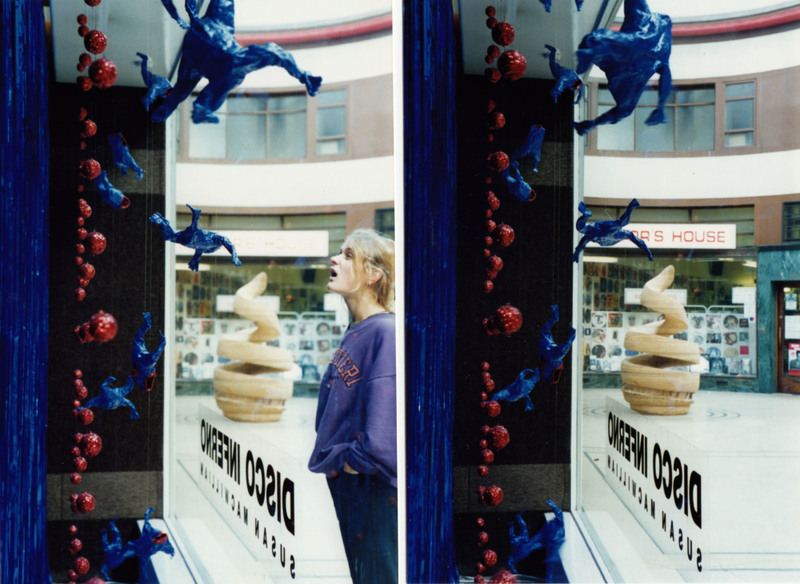 DISCO INFERNO has also been installed in Orchid Studios, Belfast and in the window of an empty shop unit in Cork city for the interdisciplinary arts festival Intermedia '97. 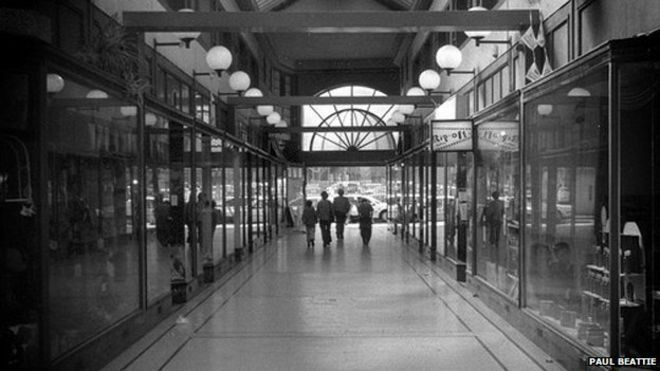 Built in 1936 North Street Arcade was burnt to the ground by arsonists in 2004. Twenty-three businesses and arts organisations operated from the premises and many lost everything. North Street Arcade remains derelict and in ruins.